One of the most uncomfortable realizations about evil is that it can be part of our daily lives. Evil in this chapter is examined in its form as large-scale violence (e.g., genocide, racism). It is easy for us to assume that atrocities are reserved for far-away places or strangers in the distant past, but such assumptions would be incorrect. Evil comes in many forms; some evildoers are extraordinary while others are not. Hannah Arendt (1906–1975) helps us think through evil when terrible deeds are perpetuated not by unique individuals (e.g., serial killers), but by ordinary people. How might we consider discussions of ordinary evil as empowering students to take action against injustice and violence? Coates, T.-N. (2013). The good, racist people. The New York Times. Retrieved from http://www.nytimes.com/2013/03/07/opinion/coates-the-good-racist-people.html. Gibson, L. (2014). Understanding ethical judgments in secondary school history classes (Doctoral dissertation). Retrieved from http://hdl.handle.net/2429/48498. Gordon, M. (1999). 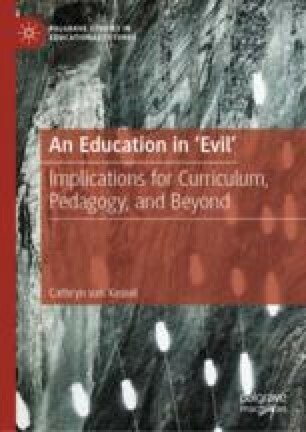 Arendt and Conrad on the banality of evil: Some implications for education. Journal of Thought, 34(2), 15–30. Retrieved from http://www.jstor.org/stable/42589573. Hamachek, D. E. (1976). Removing the stigma from obedience behavior. Phi Delta Kappan, 57, 443–446. Retrieved from https://www.jstor.org/stable/20298318. Matt. (2013, December 23). The Milgram experiment (full film) [Video file]. Retrieved from https://www.youtube.com/watch?v=wdUu3u9Web4. Truth and Reconciliation Commission of Canada. (2015). Honouring the truth, reconciling for the future: Summary of the final report of the Truth and Conciliation Commission of Canada. Retrieved from http://www.trc.ca/websites/trcinstitution/File/2015/Honouring_the_Truth_Reconciling_for_the_Future_July_23_2015.pdf. van Kessel, C. (2018). Banal and fetishized evil: Implicating ordinary folk in genocide education. Journal of International Social Studies, 8(2), 160–171. Retrieved from http://www.iajiss.org/index.php/iajiss/article/view/377. Wecker, M. (2016, June 27). How the Nazis “normalized” anti-Semitism by appealing to children: A new museum and exhibit explore the depths of hatred toward Europe’s Jews. Smithsonian. Retrieved from http://www.smithsonianmag.com/history/how-nazi-normalized-anti-semitism-appealing-children-180959539/.